The filming of my upcoming 6ft cow whip tutorial DVD is nearing completion! In the photo here, you can see the finished black and tan thong and the zebrawood blank I will be using for the handle. Today we finished shooting the construction of the thong . Tomorrow I will do the introduction segment and a segment on handles. For the sake of time and disc space, I will not show handle construction in full detail, but I will include some footage from before, during, and after it’s completed. I will be talking about different ways of obtaining handles for those who do not have a lathe. The only thing so far that I wish I could change is that I could not get the newer, better camera to work with my movie making software. Therefore, I had to use my older camera and a small portion of the footage (when zoomed in) came out a little bit grainy. I didn’t realize this until after the whip was finished, but in spite of that, I think it won’t hinder anyone’s learning. Also, I now believe this project may require 2 DVD discs. In order to find a nice home for the whip I have made for this tutorial, I am going to offer the very first DVD set and the whip from the video on eBay. It will have a signed certificate with it stating that it is the first edition DVD set and that the whip is the one I made in the video. This will be made available before the DVDs are officially for sale. Stay tuned for that announcement! I have a 5ft woody bull on eBay. 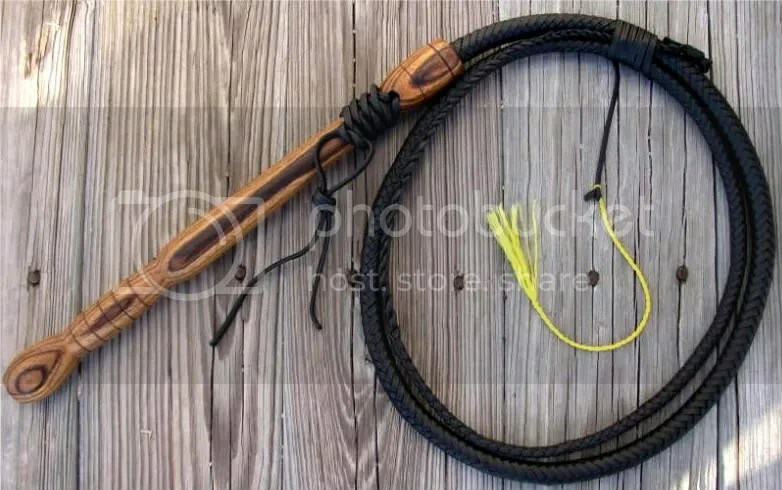 I do not anticipate taking any new orders for another month or two, so this is one of the few chances you will have to get a RK whip unless you’re already on my waiting list. Click on whip photo to see the eBay listing! Exotic Laminate Handles Now Available! I have partnered with a supplier in Florida for some very nice exotic laminate turning stock. Below is a photo of a handle I turned from one of the pieces I obtained. 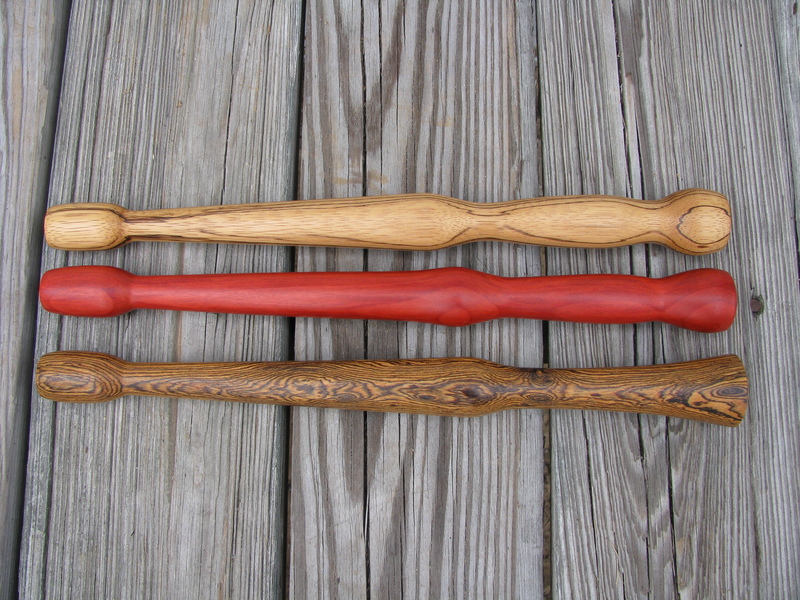 The woods used in this handle are padauk in the center, then maple, and limoncillo wood on the outer layer. The handle is 14.75″ long and weighs in at just 4.5 ounces. The photo doesn’t do it justice. I have a new shipment of exotic wood coming in and I am adding a few new species to my line-up! You don’t have to order an entire whip to get an exotic handle. 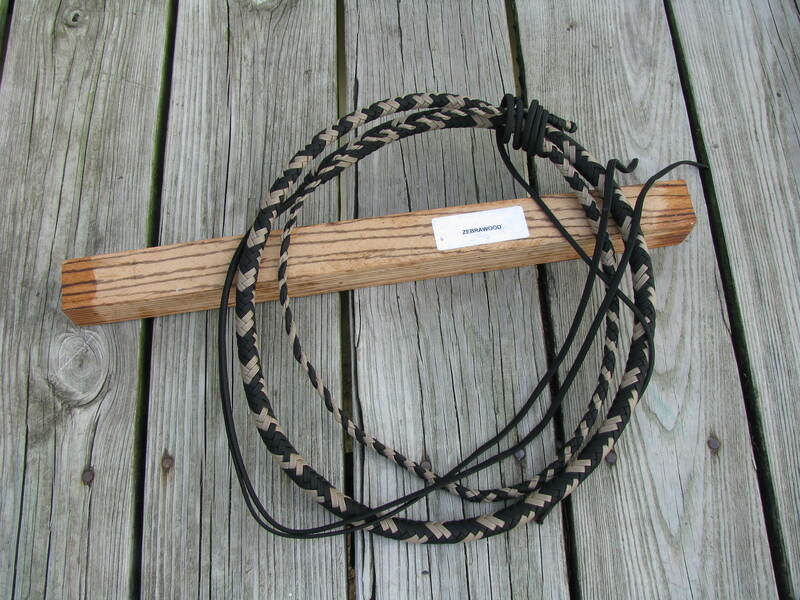 I would be happy to make you a nice, new exotic handle for a cow whip you already own. If you are interested, feel free to email me at rhettswhips @ yahoo.com.